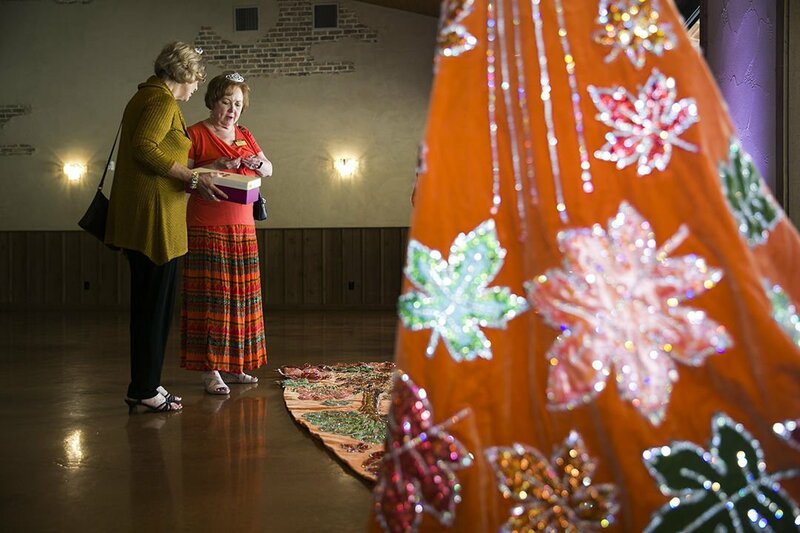 Barbara Holden and Patsy Wotipka admire a fiesta gown during the Gay Forties Club meeting at The Chandelier of Gruene on Thursday, April 11, 2019. Stephanie Bergquist smiles while listening to a speech during the Gay Forties Club meeting at The Chandelier of Gruene on Thursday, April 11, 2019. Marcia McGlothlin brought the train of the dress she wore as Fiesta Royalty in 1979 to display during the Gay Forties Club meeting at The Chandelier of Gruene on Thursday, April 11, 2019.
during the Gay Forties Club meeting at The Chandelier of Gruene on Thursday, April 11, 2019. Many are familiar with the prince of New Braunfels, Prince Carl of Solms. But in 1979, a different kind of royalty was living in New Braunfels. Once a year in the neighboring city of San Antonio, a 10-day long festival called Fiesta honors the memory of the battles of the Alamo and San Jacinto. The festival, which started in 1891, includes a royal court of a queen, a princess and 24 duchesses. In 1979, Gay 40s club member Marcia McGlothlin was one of these 26 esteemed women. 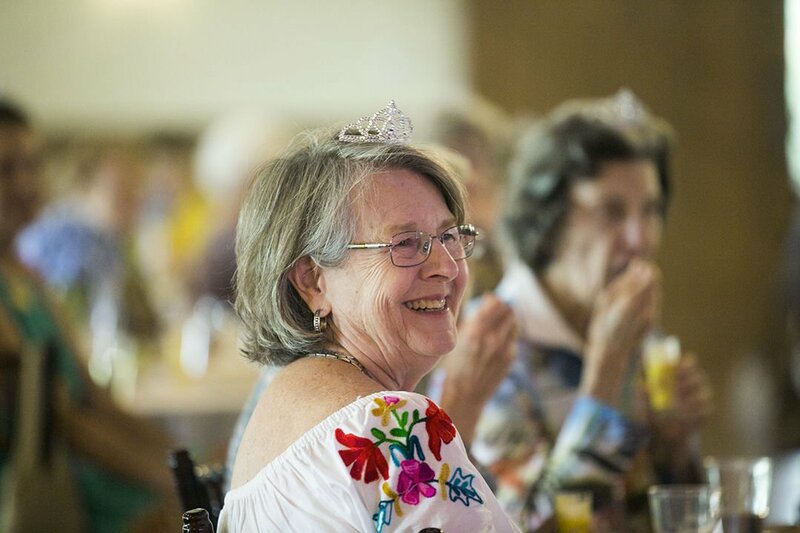 Thursday afternoon, McGlothlin took the stage in front of the Gay 40s club members to speak about her experience as a Fiesta duchess, surrounded by some of the elaborately decorated dresses and dress trains worn by fellow former duchesses. As the 150 ladies ate chicken enchiladas and looked at Fiesta medals, McGlothlin recalled the Fiesta of 40 years ago while standing aside her own intricately beaded, deep forest green dress train, which was adorned in gold trimmings and magnificent crystal beading. On the other side of McGlothin was her mother’s train, a blue velvet piece featuring a stained glass cathedral window with designs of sequined plums, pears and grapes. A rhinestone cross at the center was decorated with Easter lilies swirling gracefully around in concentric patterns. McGlothlin had to fill out forms, listing three colors of dresses she’d like to wear and one she wouldn’t. Formerly, coronations had been held at the Municipal Auditorial (today the Tobin Center) in San Antonio, McGlothlin said. After a fire destroyed a part of the building in 1979, her coronation was moved to the Convention Center Arena. The theme of the 1979 court was “The Court of the Floating Kingdom,” with each dress depicting Japanese traditions, flowers, animals, religious rites or nature, she said. After her formal selection to be a duchess, McGlothlin went to the San Antonio home of the “Mistress of the Robes,” who selects the dress colors and fabrics to be used for each woman, as well as her headdress and hand pieces. Miss Betsy Tamez, aunt of Dr. Danny Tamez of New Braunfels, made McGlothlin’s dress, McGlothlin said. Upon moving many times, McGlothlin said the dress has become lost, but she still has the 10-foot train, which she uses annually as her Christmas tree skirt. Trains can weigh between 20 to 100 pounds, McGlothlin said. McGlothlin recalls attending bow practice for six consecutive Saturdays prior to the April coronation, where she learned how to bow, stride gracefully with her 20-pound train and walk deliberately. “I distinctly remember the instructor telling us to lean forward, and walk deliberately — otherwise we would look like we were pulling a dog sled,” McGlothlin said to laughter. At her coronation, McGlothlin was introduced as the “Duchess of Early Ritual,” and was escorted by her childhood sweetheart (her husband of 40 years), Vol Forrest McGlothlin. On April 27, 1979, the day of the Battle of the Flowers parade — the longest running of the three Fiesta parades — McGlothlin remembers showing up early to get in position on floats. When the shooting began, the royal court was immediately pulled out of the parade, she said. It’s been 40 years this month, McGlothlni said. It’s prettiest in the evening, when the Christmas lights glint off the beautiful stones, she said.